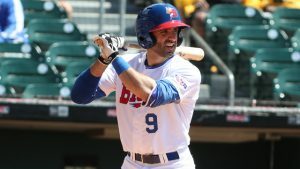 Third baseman Jason Leblebijian made tremendous strides in both phases of his game with the Buffalo Bisons in 2017. Finishing the season with a .258/.323/.405 slash line with 22 doubles, four triples, and 11 home runs in 427 at-bats; was great to see from the young infielder. Leblebijian’s increased production came from the mechanical adjustments he made to his plate approach this season. Another component that has improved in Leblebijian’s game is his ability at the hot corner. After playing every infield position in the lower levels of the minors; the prospect feels more at home with third now. Logging 564 2/3 innings at third is 2017; Leblebijian maintained a solid .976 fielding percentage, while taken part in 11 double plays and assisting on another 119 at the challenging position. An opportunity in the majors won’t be far off for Leblebijian, if he keeps developing the way he did in Buffalo. Focused on doing just that this off-season, Leblebijian has returned home to prepare for 2018. Toronto Blue Jays fans hope Jason Leblebijian can do just that and more this off-season. It doesn’t appear that he is being protected on the 40 man roster. Boston might rule 5 him. No way any team would take him in rule 5.